Title: My NS friends has named the horse "Buttercup"
Description: Ready, Set, and still waiting to Go at Flynn Yard in OKC - Ready to head south deep into the heart of Texas. Description: The IHB was using these two pumpkins to switch the west end of Gibson. Yesterday was 2 NS Dash 9s with an NW2. Description: A big blue unit passes by an orange pumpkin. Description: V MCISBD8-30 With BNSF 4546, BNSF 976, BNSF 7803, BNSF 6999, BNSF 104, BNSF 7702, BNSF 5370 , & BNSF 5398 with 75 Loads, 6757 Feet, 4560 Tons. Photographed at 17:43. Description: A whole trainload of loaded coil steel cars rolls towards BNSF Argentine Yard at Santa Fe Jct. Description: Normally you could see this train curving off into the distance, but not today with all the snow. Description: A Z9 heads under the ATSF Signal Bridges at CP Gardner on the BNSF Emporia Sub. 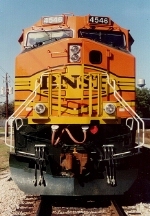 Title: BNSF 4546 leads a wb auto train. Description: During a flurry of action on the BNSF Transcon in Fort Madison, Iowa a westbound stack train is pulling into the yard while GE 4546 leads an eastbound freight for the Mississippi River Bridge. Description: BNSF 6546 going away at West Plains, Missouri. I just now noticed that the engines were 6546 and 4546. Description: BNSF orange is seen in CN's Stevens Point yard a week or so before Halloween 2015. BNSF 4032 & 4546 will be added to a southbound CN freight and head out later this evening. Description: BNSF 4546 waits at the east end of the CN's Stevens Point yard. Some "artist" decided to use the side of the fuel tank as a canvas. Doesn't look very artistic to me. Description: BNSF 4032 & 4546 get their signal and head west out of the yard at Eola, IL. Description: BNSF 4032 & 4546 get their signal (while BNSF 5348 continues to wait) at head west out of the yard at Eola, IL.